The Touch Paint sample application demonstrates how you can create a simple paint application using the touch events and the Canvas element. 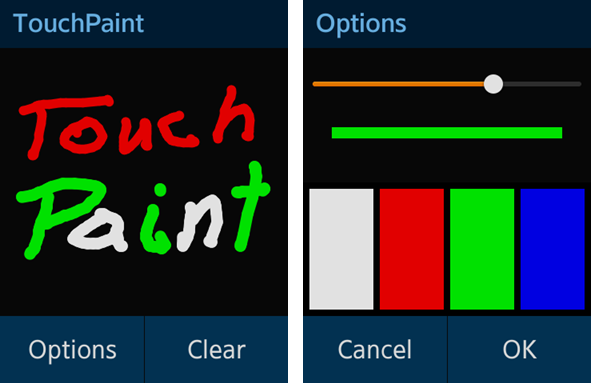 The following figure illustrates the main screens of the Touch Paint. The application opens with the main screen where you can see the painting canvas. You can draw on the canvas with your finger. To change the color or line width, click Options, make your selection, and click OK. To clear the canvas, click Clear. js/core/ This directory contains the core library. js/models/options.js This file defines the module providing the functions to change the brush properties. js/views/ This directory contains the code for handling the UI events for all pages. The init() method initializes the application. The initialization consists of the canvas size calculation and event listener definitions for all UI elements used in the application. When a touchstart event is triggered, a filled circle is drawn in the initial position. This position is stored in the drawPath array. When a touchmove event is triggered, the coordinates of the previously triggered touchmove event stored in the changedTouches attribute are saved in the drawPath array and passed as a parameter value of the moveTo() method. The coordinates of the current touchmove event are passed as a parameter value of the lineTo() method and the connected line is created. When a touchend event is triggered, the stored position is deleted.